the king is dead... long live the king? We have first sight of a rim that many people would consider long-overdue; Mavic appear to have poured a load of technology and a dollop of practicality into their new Open Pro, which shares only its name with its predecessor. - maybe it won't be a £45 rim any more. On the latter point I think that will be certain. But even at a considerably higher price, if it frees us from many of the shortcomings of 'factory wheels' then it can't be all bad. So if I want my bike not to look piebald I now need to buy two new rims and not just one. Audax67 wrote: So if I want my bike not to look piebald I now need to buy two new rims and not just one. time to lay in stocks? Brucey - when you've found out more, and have some feedback, would you update us please? If there's one thing I've noticed about Mavic rimes, which have for decades been my default choice, is that as the models are successively "improved" they've given less and less mileage. Remembering that rim wear is a product of braking, and braking is a product of terrain (i.e. more hills in Yorkshire than in Norfolk) and that riders from different parts of the country will give different mileage figures, I was averaging 17,000+ miles out of G40s and 'Open CD's from 30ish years ago, and I now get just about 10,000 mile out of Open Pros. My current Open Pros are as stiff and responsive (and presumably as strong) as the 'Open CD's, but a little lighter. I've not noticed much, if any, difference in braking between the 'Open CD's and the Open Pros, before or after the anodising wore off the 'CD's braking surface. Indeed, one of the questions about these new 'Open 'Pro's is whether the anodising will affect braking, but I'd submit that Mavic will have thought of that and to the best of their ability designed any problems away. The issue could be mileage. I'm in my 70s now, but right up to my mid 60s I was doing 10,000 miles a year and on that basis, if I'd only had one bike, I'd have been renewing wheels every year. Mavics are not cheap rims and personally I don't welcome any further increase in my cycling costs per mile. Is there any info on number of spoke-holes? I'd welcome further info and opinion from you Brucey. Have you any responses to the points and questions in 'the snail's post (above)? So Keronite is a conversion treatment, like anodising, but it is much, much thicker and harder wearing. I doubt very much that it will wear out on braking surfaces inside 30000 miles. However any product that has this treatment on it must be further treated in manufacturing to remove the uppermost, rough, more friable layers of the surface. Typically this has been done by polishing using SiC abrasive, but in wear applications the surface condition will still change as time goes on. The most common result is that the surface becomes (microscopically) smoother as time goes on, and pores in the surface either unclog themselves or clog up with debris depending on what the conditions are. I have not been involved with this particular product development, but it seems to me that the surface has had some kind of additional/variant treatment to render it the colour that it is. All hard-treated rims change over time, and/or behave differently in the wet; it remains to be seen how these rims perform in the real world. Quite probably the first sets of brake blocks could usefully be different to those that might be used subsequently. So I am hoping, fingers crossed, that this will truly be a 'rim for all seasons'; lightweight, strong, durable, long lasting. Only time will tell! Brucey wrote: ............................. I am hoping, fingers crossed, that this will truly be a 'rim for all seasons'; lightweight, strong, durable, long lasting. Only time will tell! Thanks Brucey - thanks for all of that. BTW the rim in the picture appears to be a 32h rim. I hope that they will do a 36h one too! Any thoughts on max' tyre size? 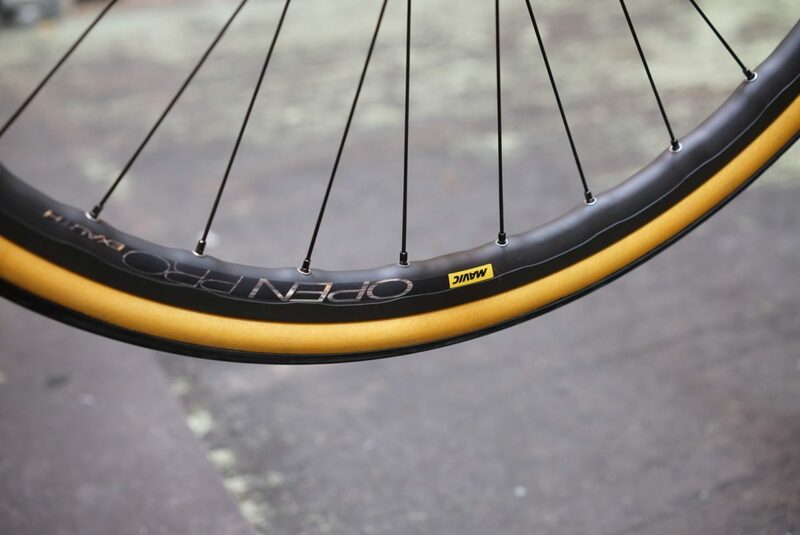 The new Open Pro is reputedly 19mm internal width; in recent years Mavic have allowed much larger tyres on any given rim than they used to recommend, so I'd expect 45-50mm to be allowable. They govern wider tyre fitments by allowing different maximum pressures as a function of tyre width, since (at any given pressure) the load on the rim increases pro-rata with tyre width (more or less). Somewhere on their (rotten) website there is a chart that tells you all about it. In practice the end result is that for unladen solos, there is probably no issue; the lower pressures that you typically want to run with wider tyres do not increase the rim loading excessively. However for more heavily laden bikes (loaded touring bikes, tandems etc) that want to run high pressures and wide tyres you can run into trouble. I have seen a few (old, well-used) Mavic rims that cracked in the inner wall, between spoke holes; I think they may have been fitted with wide tyres, pumped very hard, but I don't know that for sure. Brucey wrote: BTW the rim in the picture appears to be a 32h rim. I hope that they will do a 36h one too! Absolutely Brucey - I'll not have less than 36 hole myself. JohnW wrote: Absolutely Brucey - I'll not have less than 36 hole myself. Looking grim on that front. Mavic is claiming 420 g for all three models: one with a machined alloy braking surface, one with an Exalith surface, and one for disc brakes. Is the wavy shape around the rim just a cosmetic thing? It's a pity there will be no 36. But maybe the exalith finish will be used with other rims. I find Open Pro a bit dent prone anyway. Paying a lot more for something (caramic/tungsten carbide/exalith) that greatly extends rim life can pay off. It has for me. My wife is riding on Open Pro Ceramics that must have done at least 8000miles and show no sign of wear yet. My own tungsten carbide impregnated CSS rims date from the times of King Tut and the braking surface is still completely flat. Both had braking issues, now resolved, but the CSS have so far triple normal life, and the Ceramics look like they are going to last very well. I'd be willing to pay double for a rim that held out a realistic hope of exceptional durability. no, absolutely not; the rim is machined so that it is left thicker (thicker than in most other rims, potentially) near the spoke holes for strength, and thinner elsewhere for light weight. suggests that rim brake versions (one with and one without the exalith treatment) will be available in 24h,28h,32h and the disc brake version will be available in 28h, 32h. Some sources are claiming 420g and others 435g. I doubt that the three versions will be exactly the same weight. BTW if these rims are tubeless compatible, I do hope that they have not made the rim well shallow and the tyre fit stupidly tight; one of the good things about the old Open Pro was that tyres would go on and off relatively easily. Oh. Sounds clever. But also expensive! If they end up being a hundred quid, they may not make a dent in the market. I don’t think these rims are for me even if they’re much cheaper, but I’ve always respected Mavic’s engineering know-how and general competence. Let’s see.